The history of Mercedes-Benz trucks dates back to 1896, when Karl Benz and Gottlieb Daimler introduced their first truck concept of “motorized goods vehicle” designed to carry 600 kg, but its final payload was 1,5 tons and it was driven by 2-cylinder Phoenix engine rated at 4 hp. Since that time, Mercedes-Benz has introduced many efficient innovations such as powerful drives, autonomous driving, active and passive safety systems or ergonomic and low-entry design. 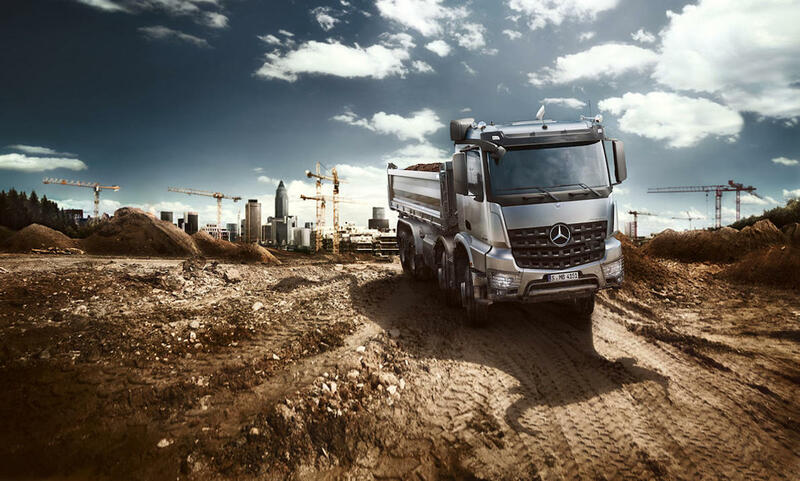 Mercedes-Benz provides solutions for both on-road and off-road heavy-duty applications such as long-haulage transportation (Actros), construction industry (Arocs, Atego), distribution operations (Atego, Antos, Econic), municipal usage (Econic) and also special purposes (Unimog). Mercedes-Benz Actros trucks are on-road heavy-duty vehicles manufactured since 1996 (Actros I version). Later on, Mercedes-Benz followed with releases of Actros II (2002), Actros III (2007) and Actros IV (The new Actros 2011). In September 2018, Mercedes-Benz revealed a new truck concept in Hannover, Germany — the 2019 Actros. Mercedes-Benz Actros trucks are suitable for long-distance transport, heavy-duty distribution haulage, construction haulage and military applications (Armoured Heavy Support Vehicle System). Mercedes-Benz The new Actros trucks are equipped with automated transmission and economic and environmentally-friendly 6-cylinder in-line diesel engines with turbocharger and intercooler. Mercedes-Benz offers 18 output ratings of engines ranging from 175 kW (238 hp) to 460 kW (625 hp). All engines are Euro VI compliant (consuming 5% less fuel compared to Euro V) and feature 4 displacement classes from 7.7 l to 15.6 l. Mercedes-Benz Actros is offered in 11 sleeper cab variants in 5 roof shapes (cab types) and 2 cab width variants of 2300 and 2500 mm. The rigid chassis of Mercedes-Benz Actros is offered in 2-axle or 3-axle variants, whereas the Actros tractors feature 2, 3 or 4 axles. The gross vehicle weight rating range of Mercedes-Benz Actros trucks is between 18 and 44 tonnes. There is also a special version of heavy haulage Mercedes-Benz truck — The Actros SLT up to 250 tonnes, enhanced with robust chassis made for particularly heavy and huge loads. Mercedes-Benz also offers two sector-specific vehicle concepts — The Actros Loader for payload-sensitive transport and Actros Volumer for volume-oriented haulage. Launched in 2012, Mercedes-Benz Antos features on-road heavy-duty distribution trucks rating from 18 to 44 tonnes of gross combined weight (moreover, heavy haulage up to 120 tonnes). Mercedes-Benz Antos trucks are also suitable for applications such as grocery and refrigerated transport, tanker, dry-bulk haulage or retail supply services. Mercedes-Benz Antos is offered in 6 day cab variants and equipped with rigid or tractor chassis (2 and 3 axles). Mercedes-Benz Antos truck can be equipped with one of 13 power ratings of 6-cylinder Euro VI engines (OM 936 - 7.7L, OM 470 - 10.7L and OM 471 - 12.8L) rated from 175 kW (238 hp) to 375 kW (510 hp). Antos trucks are furnished with automated transmission and its maximum travel speed is 89,8 km/h. Similarly to Mercedes-Benz Actros, also Mercedes-Benz Antos offers two sector-specific vehicle concepts — Antos Volumer for volume-oriented haulage and Antos Loader for payload-sensitive haulage. Mercedes-Benz Arocs trucks, launched in 2013, are both on-road and off-road construction industry transport vehicles with robust design. The gross vehicle weight rating of Mercedes-Benz Arocs ranges between 18 and 41 tonnes. Mercedes-Benz offers 9 sleeper cab types with robust design (18 variants in total) for construction transport. The cab width options of Mercedes-Benz Arocs are 2300 and 2500 mm and cab length options are 1700, 2000 and 2300 mm. Mercedes-Benz also offers 3 versions of ergonomic cockpits. Mercedes-Benz Arocs can be equipped with Euro VI engines (18 in total) rated between 175 kW (238 hp) and 460 kW (625 hp) with displacements between 7.7 and 15.6 litres. The strongest Arocs engine is Mercedes-Benz OM 473 (625 hp), whereas the second generation engines OM 471 (12.8 l) and OM 470 (10.7 l) provide 3% fuel savings compared to their predecessors. Mercedes-Benz Arocs feature both automated and manual transmission. The chassis of Mercedes-Benz Arocs can have 2,3 and 4 axles and it is available in rigid, mixer, tipper and tractor modifications. Moreover, Mercedes-Benz developed two Arocs sector specific concepts — the “loader” (concrete mixer vehicle) and the “grounder” (rigid vehicle, tipper, concrete mixer or tractor unit). The Arocs SLT-version is a heavy haulage Mercedes-Benz truck with robust chassis, suspension and frame rated at up to 250 tons. Mercedes-Benz Atego on-road and off-road trucks are manufactured since 1998 (the newest version since 2013) in two vehicle concepts. The first one is suitable for light and medium duty distribution, offering 4 cab and 3 cockpit variants and rating between 6,5 and 16 tonnes of gross combination weight (GCW). The second Artego concept is more suitable for construction industry transport and other specialist applications of building materials industry such as the gardening sector, at urban construction sites and in the trades. Mercedes-Benz Atego construction concept rates between 7,5 and 16 tonnes GCW and it is offered in classic S-cab or extended rear wall S-cab variants and 3 cockpit options. Mercedes-Benz Atego trucks are equipped with 4 and 6-cylinder in-line engines (Euro VI) rated from 115 kW (156 hp) to 220 kW (299 hp). Mercedes-Benz Atego trucks offer rigid 4x2, rigid 4x4 or tractor 4x2 chassis types. Introduced in 1998, Mercedes-Benz Econic is both on-road and off-road vehicle specifically designed as a “safety first” truck. Those safety features include driver assistance system, blind spot camera system, panoramic window for maximum visibility and ergonomic low-entry concept (only 2 stairs). Mercedes-Benz Econic can be used as a truck for waste and refuse collection, recycling, road maintenance, fire and emergency purposes, construction, urban distribution, airport ground duties and other municipal and specialist applications. Mercedes-Benz Econic is further enhanced with low or high roof cab (2 options) and the truck can be used with rigid chassis (2, 3 or 4 axles) or tractor chassis (2 axles). Econic trucks can be equipped with 6-cylinder Euro VI Mercedes-Benz diesel engines rated from 220 to 260 kW (299 to 354 hp) or natural gas engines rated at 298 hp. Moreover, Mercedes-Benz Econic trucks feature 6-speed automated and automatic transmission for smoother travel. Standard gross combined weight of Mercedes-Benz Econic trucks ranges from 18 to 26 tonnes. In February 2011, Mercedes-Benz manufactured and delivered the 10,000th Econic truck. Mercedes-Benz Unimog are specialist vehicles and multi-purpose medium trucks manufactured since 1950’s. Unimogs are tough, capable and versatile as they can serve various on-road and off-road tasks during all conditions (snow, flooded roads, forests, deserts, moorlands). Unimog trucks are equipped with environmentally-friendly Euro VI engines, their top travel speed is 90 km/h and they are equipped with safety features such as camera systems and panoramic windscreens for maximum visibility. Mercedes-Benz Unimog trucks are also agile due to shorter wheelbase (starting from 2800 mm). There is also a double cab option allowing the transportation of 7 passengers. As stated before, Mercedes-Benz Unimog vehicles are suitable for wide range of usage, including municipal (mowing and gritting), agricultural (mowing, forestry, mulching, hedging), utilities and energy, road rail (repair and maintenance, over-head works) and fire and disaster relief (flooding, earthquakes, avalanches, mudslides). Mercedes-Benz Unimog trucks base range is divided into 2 model platforms. The first platform contains range of U 216/U 530 implement carriers (9 basic models in total). Unimog U 216/U 530 models do everything a tractor can, however, they have more mounting points and large range of implements for better versatility and effectiveness, which makes them suitable in all kinds of industry sectors. Unimog U 216/U 530 trucks are equipped with OM 934 and OM 936 engines rated from 115 kW (156 hp) to 220 kW (299 hp). The second platform of Mercedes-Benz Unimog trucks contains range of all-terrain U 4023/U 5023 high mobility models (ultimate off-roaders) with all-wheel drive. The second range of Unimog trucks contains larger vehicles than the U216/U530 range. Unimog U 4023, U 5023 and U 5030 trucks are even suitable to places with extreme conditions such as jungles, deserts or frozen wastelands due to their great torsional rigidity. Mercedes-Benz Unimog U 4023 and U 5023 models are equipped with 4-cylinder OM 934 LA engines rated at 170 kW (231 hp), meeting Euro VI regulations. Unimog U 5030 truck is equipped with OM 936 LA engine rated at 220 kW (299 hp), and therefore providing even greater power than Mercedes-Benz Unimog U 4023 and U 5023.